The steel framework at Magnesium Court, the first new-build industrial/warehousing scheme to be constructed at Eshton Group’s £50 million Burnley Bridge Business Park development, has been completed. A major milestone in delivering the 70-acre industrial and distribution park, completion of the steel frame, puts development of the 29,000 sq ft of Phase 1 speculative space on track to meet the end of February completion date. Magnesium Court is capable of providing flexible accommodation for two to six occupiers, in units ranging from 3,500 sq ft to 19,000 sq ft. The 64,100 sq ft Cobalt Building refurbishment scheme is also underway. Commercial property development and investment company, Eshton Group, has also put a third speculative scheme in for planning and construction is expected to start on the 15,000 sq ft Lithium House at the entrance to the business park in the second quarter of 2014. 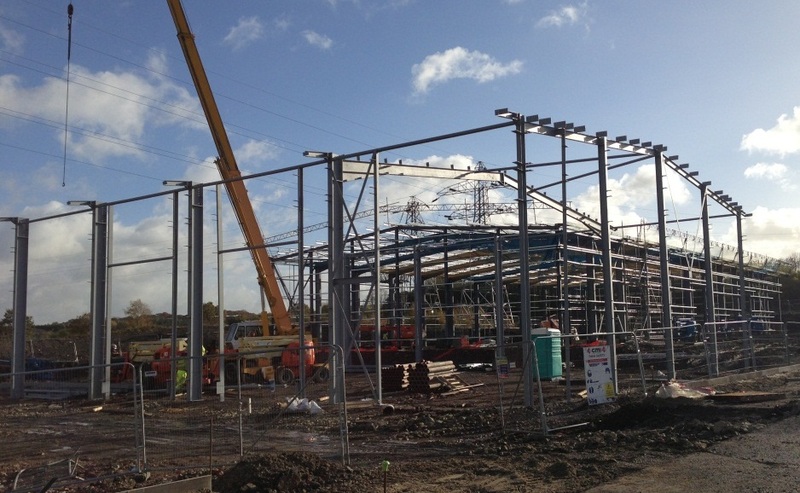 James Chapman, managing director of Eshton Group, said: “With the steel frame now completed at Magnesium Court, and the new bridge that will connect the business park to the M65 due for completion at the end of the month, Burnley Bridge Business Park is now really taking shape. Recently awarded the prestigious ‘Most Enterprising Area in Britain’ accolade by the Government’s Department for Business, Innovation and Skills the recent recognition demonstrates that Burnley is in a strong position to generate economic growth. Burnley Council leader Julie Cooper said: “The Burnley Bridge development will unlock the massive potential that the site has in terms of attracting businesses into the borough and creating new jobs – the development further reinforces Burnley’s reputation as open for business and a great place for business”. Construction of the first phase of accommodation, along with the infrastructure, releases £3.85 million in European Regional Development Fund (ERDF) money towards the scheme’s development costs and a £2.4 million development loan from the Lancashire Enterprise Partnership’s Growing Places fund, which is administered by Lancashire County Council. Many of the remaining properties that will be built at the business park will be constructed to occupiers’ specifications as tenants come on board, with the whole development expected to create 1,400 sustainable jobs once fully-occupied. For further information on available units, or bespoke buildings, contact Michael Cavannagh at Trevor Dawson on 01282 458007 and Mike Haigh at Dove Haigh Phillips on 0113 245 0550.